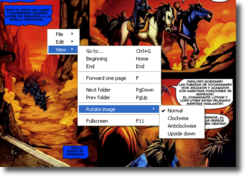 QManga is a minimalist comic reader for Windows. QManga, as the name suggests, is designed for reading manga, but it can also be used to read any comics, as long as the file format is supported by the application. It's pretty pared-down, but provides a clear, customizable fullscreen view that will show your comics at their best. ...... Usefully, QManga doesn't need to be installed, and supports a variety of file formats, including PNG, GIF, JPG, ZIP and RAR. QManga is a beautifully simple, clear comic reader thata�?s perfect for manga. The QManga application was developed to be a manga reading tool. Qweas is providing links to QManga 0.3 as a courtesy, and makes no representations regarding QManga or any other applications or any information related thereto. Any questions, complaints or claims regarding this application QManga 0.3 must be directed to the appropriate software vendor. You may click the publisher link of QManga on the top of this page to get more details about the vendor.